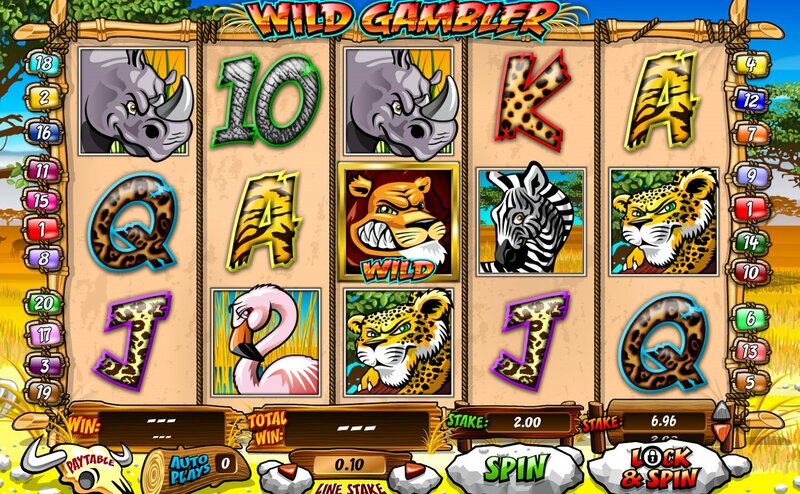 Do we really need another safari-themed video slot online? Well, the usually innovative slot developer, Ash Gaming, certainly think we do, and they’ve loaded their 5 reel, 20 pay-line slot with enough unique features to make it worthwhile. 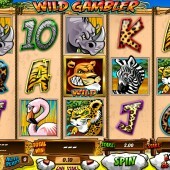 Wild Gambler puts you straight into the heart of the African savannah, complete with lions, zebras and giraffes. Betting options are fairly wide – running from $0.01 to $10 a coin – and the graphics are bright and breezy, with some nice sound FX thrown in for those winning combo moments. Elsewhere on the reels you’ll find rhinos, elephants and meerkats, plus, of course, the obligatory card symbols to fill out the reels. Hold the Wild Lions Down! So far, so ho-hum. But here’s where Wild Gambler throws us a curveball. If you look out for the Wild lion symbols (Question: Why are lions always Wild? Can’t we have a Wild giraffe once in a while?) that substitute all regular symbols on the reels, you can hold the Wilds in place till the next spin. In addition, for an extra bet you can turn other symbols Wild too. Click on the ‘Lock and Spin’ button once you’re done and the Wilds will stay in place while you spin the reels. It’s a great little feature – rather reminiscent of classic old-school slots where you can ‘Hold’ your reels – but make sure you’re keeping on top of your betting; when I played it this way a few times I found my bankroll dwindling pretty fast. Before you get too distracted by the Wild feature, remember that there are also some free spins to be had here – eight in fact. These can be triggered by hitting five meerkat Scatters anywhere. They just pop up across the screen at random so you’re playing into the luck of the game, to be honest. As we mentioned at the top of the review, safari-themed games are 10-a-penny in slotsland, but with the African-themed Safari Spirit from Ainsworth or Betsoft Gaming’s beautiful 3D-rendered adventure slot, Safari Sam, leading the pack, Ash needed to pull out the stops. For fans of action, they certainly have done. With some nice animation, jolly music in the background, and a nice ‘Hold' feature, Wild Gambler is a great addition to Ash Gaming’s arsenal. You might also want to check out the snowy-themed sequel this slot spawned in the form of Wild Gambler - Arctic Adventure.